Preferences is a dialog for setting personal default settings for various TouchDesigner options. 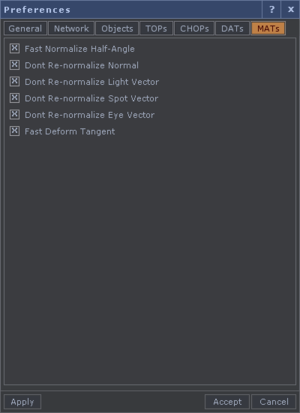 These preferences are found in the Edit menu under Preferences.... These options are saved so they apply to your next TouchDesigner session. These are split into several pages. The images below provide a summary of the initial default preferences after installation. Increment Filename when Saving - When On name of your .toe file will have a number suffix increments every time you save the file. This does not happen with Save As, only with Save. When set to On and Copy to Backup Folder then the extra numbered .toe files will be placed in folder called Backup in the project's location on disk. Create Link Filename when Saving - Creates a file that with no number increment that is the same as the most recent file saved. This makes it easy to open the most recent file. Prompt to Save on Exit - If Prompt to Save on Exit is enabled, a pop-up dialog will appear whenever you attempt to close TouchDesigner. You will be prompted to either Save & Quit, Discard & Quit, or Cancel. The value of Increment Filename when Saving will be honored when you select Save & Quit. Stop Playing when Minimized - When enabled, animation will stop playing forward when the main TouchDesigner window is minimized. Once the window is reopened, playback will continue. Maximum Size of Open Recent Menu - Sets the maximum number of files (1-20) that will be displayed in the File > Open Recent menu. Expose Expert Operators on Startup - Makes additional expert level operators visible in the OP Create Dialog. On/Off Parameter Behavior - This sets how the On/Off toggles in parameter dialog function. Choose between clicking anywhere to toggle the state or specifically clicking on the left side for Off and right side for On. Enable Warning Sounds - An short sound will be played whenever a warning dialog is triggered. Enable Playbar Shortcuts - Turn off to disable keyboard shortcuts for TouchDesigner's main Playbar. Check for Experimental Builds - Includes Experimental builds when checking for available updates. Offline Help Folder - Path to the folder containing Offline Help. Offline Help Date - The date of the Offline Help located in the Offline Help Folder above. Always Use Offline Help - Forces TouchDesigner to use Offline Help first, instead of checking the online help. Help Tags - Enable or disable help pop-ups in the interface. Default Node Language - Determines whether new operators are created in Python Mode (default) or Tscript mode. 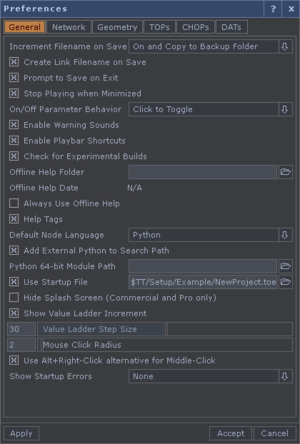 Add External Python to Search Path - When enabled TouchDesigner will automatically add python33 installation folder into the module search path. Python 64-bit Module Path - Additional search paths for python module search. Use Startup File - Allows for any .toe file to be loaded on startup. Hide Splash Screen - When this is turned on, the splash screen will not show when TouchDesigner starts up. This feature is only available in Commercial and Pro. Mouse Click Radius - Number of pixels mouse clicks cover. Helpful for using stylus or other devices where double clicking on the same pixel is difficult or other accuracy issues arise. Show Startup Errors - Show nothing, just warnings, or all errors on startup. Center Zoom on Mouse - Zooms the Layout Area in the Network Editor so that the point right beneath the mouse cursor is the center of the zoom. Resize TOP Nodes to TOP Viewer Aspect - When selected, the size of TOP node will be locked so that the OP Viewer will not distort the underlying TOP. Resize Panel COMP Nodes to Controlpanel Aspect - When selected, the size of Panel node will be locked so that the OP Viewer will not distort the underlying Panel. Mouse Wheel Navigation - Allows users to move up and down the OP hierarchy by using the mouse wheel. 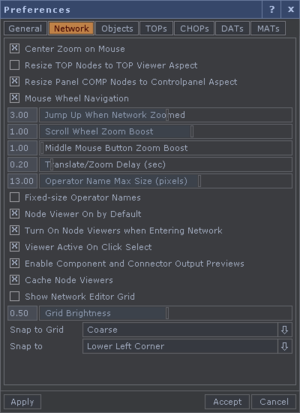 Jump Up When Network Zoomed - Sets the network zoom level which when reached will cause TouchDesigner to move up a level in the OP hierarchy. Scroll Wheel Zoom Boost - A multiplier on the scroll wheel zooming feature. The higher the number, the quicker the network will zoom in and out on mouse wheel scrolls. Middle Mouse Button Zoom Boost - A multiplier on the middle mouse button zooming. The higher the number, the quicker the network will zoom in and out using the middle mouse button. Translate/Zoom Delay (sec) - Amount of lag in seconds added to translate or zoom operations on a network. Operator Name Max Size (pixels) - Maximum height in pixels that operator names will appear in a network when zooming in. Fixed-size Operator Names - If selected, operator names will not shrink and grow as the network is zoomed in and out, but instead will maintain a constant size through all network transformations. Node Viewer On by Default - Turn on the Node Viewers on all OPs by default. Turn on Node Viewers when Entering Network - Turn on the Node Viewers on all OPs in a network when the network is first entered. Viewers Active On Click Select - Turn on the Node Viewer of an OP when it is selected by clicking on the OP. Cache Node Viewers - Remember viewer layout for quicker navigation back and forth between networks. Show Network Editor Grid - Show grid on network background. Grid Brightness - If network grid is visible, adjust the brightness of the grid relative to the background. Snap to Grid - Sets the size of the grid to snap to for nodes. Can be set to Off, Coarse or Fine. Snap to - Sets the part of the node that will snap to the grid. Can be set to Lower Left Corner or Node Center. Keep Position when Parenting - If unchecked, objects will assumed a position relative to the parent object when parented. Leaving the selection checked will allow objects to keep the world position. Geometry Viewer BG Color - Adjust the grayscale level of Geometry Viewer's background color. This is reflected in all 3D viewers including Object Component viewers, SOP viewers, and MAT viewers. Adaptive Homing by Default - All new 3D Viewers created will have Adaptive Homing turned on. Grid Visible by Default - All new 3D Viewers created will have Grid turned on. 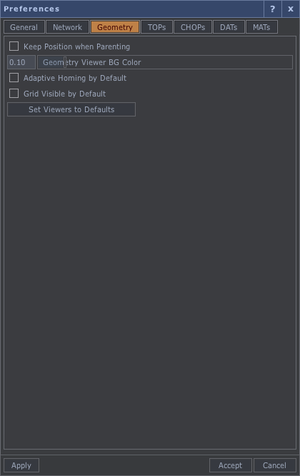 Set Viewers to Defaults - Sets all viewer to the default set above. Viewer Background - Change between a Checker Board or a Black background for TOPs. Global Resolution Multiplier - Multiplier for default resolution in all TOPs. 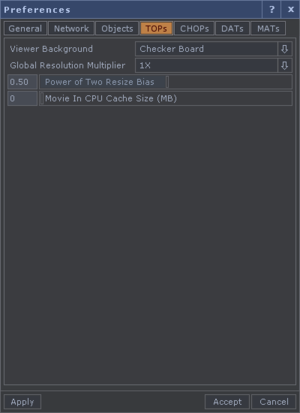 Power of Two Resize Bias - Sets the bias for when to switch between different power of two resolutions for some older video cards. Movie In CPU Cache Size (MB) - Cache size to reserve on CPU for Movie File In TOPs. Refer to Movie File In TOP for details on proper use. Maximum Time Slice Size (frames) - Sets an upper bound on the number of frames a time-sliced CHOP will process between successive screen updates. The default limits a time slice to be 6 frames). Minimum Text Size - The minimum text size used for Time Sliced CHOP viewers. Maximum Text Size - The maximum text size used for Time Sliced CHOP viewers. 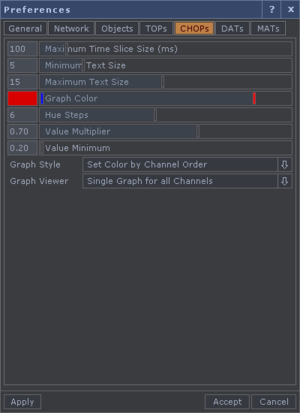 Graph Color - Sets the start color used when assigning colors to channels in CHOP graph viewers. Hue Steps - Sets the number of distinct hues assigned to the channels. After this number of colors is assigned, additional channels reuse the hues but apply the Value Multiplier below. Value Multiplier - After the number of colors specified in Hue Steps are assigned, additional channels reuse the hues but apply this Value Multiplier. This process is repeated as the Value Multiplier is reapplied each time the colors cycle through the number of Hue Steps. Value Minimum - Sets a minimum value for the colors assigned. Graph Style - Sets the way colors are assigned to the channels. Set Color by Channel Order - Uses the channel order to assign colors. Set Color by Channel Name - Uses the channel names to assign colors. Set Color by Path and Channel Name - Uses the path and channel names to assign colors. Graph Viewer - Sets the display mode for graph viewers. Single Graph for all Channels - This mode displays all channels in a CHOP in one graph. Single Graph per Channel - This mode displays each channel is its own graph. File Format - Select the file format that the text will be stored in. Choose from Windows or Unix. Minimum Text Size - Sets the minimum height in pixels for text when zooming out. Maximum Text Size - Sets the maximum height in pixels for text when zooming in. Preferred Text Size - Sets the preferred text size. Text will default to this size if not zoomed out or zoomed in too far. 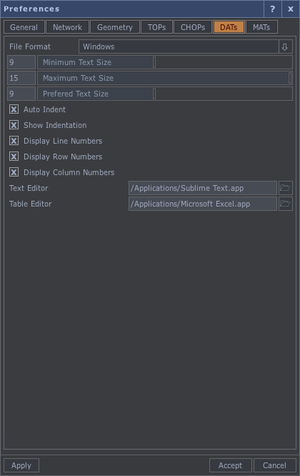 Auto Indent - When enabled, pressing enter for new line will start the next line at the same level of indentation. Display Line Numbers - Displays line numbers for DATs with text data. Display Row Numbers - Displays row numbers for DATs with table data. Display Column Numbers - Displays column numbers for DATs with table data. NOTE: Using any of the MAT Preferences to speed up calculations of material normals and vectors, but be aware that doing so may cause artifacts to appear in your materials. Use local settings on MATs in the Optimize Parameter page to override these global values.